The numerous pet food options available today often present a quagmire to most pet owners – as it can be difficult to process all of it! Essentially, dog and cat foods are processed six different ways to become the end product – kibble, canned, dehydrated, freeze dried, raw, or home cooking – that your pet eats. When you enter a grocery store, you are presented with fresh foods, canned foods, cereals, and frozen foods. 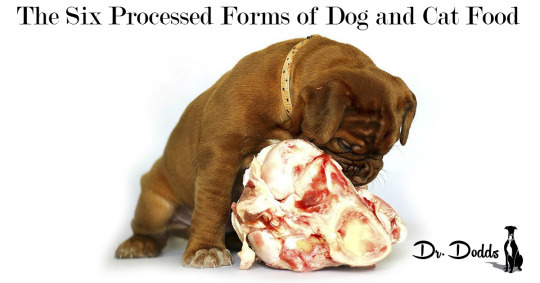 The “forms” you find in grocery stores are very similar to what you find in pet stores. Think about a steak. If you like a well-done steak, you have removed most of the vitamins and, by overcooking, have increased the likelihood of forming carcinogens called heterocyclic amines (HCA), while at the same time, increasing the iron content. Conversely, a rare steak increases the risk of E. coli contamination but retains the natural vitamins. Similar to human cereal foods, kibbles are cooked via a process called “extrusion”. Kibble extrusion involves the use of an extruder machine, which mixes all of the ingredients together into dough and cooks it at temperatures ranging from 176-392° Fahrenheit. The extruder then forms and cuts the dough into the desired shape and size, resulting in the dry nuggets you pour into your dog’s bowl. The extrusion process adversely affects the quality of the food in several ways. Remember the steak analogy? The high temperatures necessary for extrusion decrease the natural vitamins and minerals. So, pet food companies must restore them to the food to meet AAFCO standards. Extrusion also kills valuable enzymes and probiotics. In addition, kibble contains only 6-10% moisture and dogs need approximately 70% moisture in their diets. Some kibbles are also sprayed with chemical flavor enhancers, colors and preservatives. Canned pet food is – on average – one of the more expensive options. The consumer price rises for several reasons but mostly due to the weight of transporting cans or plastic containers that have high moisture contents (75-80% water). The meat ingredients are usually all ground down or served in small chunks, combined with the other ingredients and vitamins and minerals. The ingredients are placed in a mixer and the temperature is increased. The food needs to gelatinize during this stage. Some canned food companies may add thickeners and gels to enhance this process. Next, the mixture is divided amongst the individual cans. Once the cans are sealed, they are heated to 250° Fahrenheit for a minimum of three minutes. This ensures that Clostridium botulinum is destroyed. On a final note, please make sure the cans are certified as BPA (bisphenol A)-free. BPA is a synthetic estrogen that is an ingredient of the epoxy coating that lines the insides of most food cans made in the United States. BPA has been linked to endocrine disruption, so it may block or stimulate the body’s hormone systems, such that exposure to even miniscule amounts of these chemicals can have large effects on the developing brain, nervous system and reproductive systems of people, laboratory and other animals and wildlife. The fight continues whether or not BPA leaches from the cans to the food ingredients. I urge caution regarding this topic until more studies have been conducted. In your local supermarket, dehydrated pet foods would be similar to the dried soup mixes you can purchase. They are finely chopped up ingredients that are dehydrated and then mixed together. Dehydration uses warm air to slowly evaporate a food’s water content. The levels of temperatures used by dehydrated pet food companies varies. In general, fruits and vegetables are dehydrated at 104° Fahrenheit. Meat and fish are steamed prior to dehydration at a temperature of 140-165° Fahrenheit. Potatoes and grains are flash heated to break down the cellulose and then dried. A benefit of dehydration is that it diminishes the growth of pathogens such as bacteria, yeasts and molds without adding chemicals, since pathogens need water to grow. Typically only about 90-95% of the water is removed during the dehydration process, so growth of bacteria is not completely avoided. Freeze Dried is another option though it may be a bit pricier because of the cost in processing it. Freeze-drying removes a food’s water content without using heat. Freeze-dried foods are first flash-frozen, then placed in a special pressurized chamber. Drastically decreasing the pressure and increasing the temperature inside the chamber, while still keeping it below the freezing point, changes the ice in the frozen product directly from a solid to a gas, bypassing the liquid stage. This occurs over a period of several hours or days, until the product is virtually completely dried, with just a tiny amount of water remaining. Finicky pets generally prefer freeze-dried foods. It is also good to add as a topper to increase palatability of the main meal. Raw food would be the equivalent of the rare steak. Generally, a raw commercial diet consists of animal meat, organ meats (such as the liver, kidney and heart), some bone, and vegetables given in their raw, uncooked state. So, the majority of nutrients — such as amino acids, vitamins, minerals, prebiotics, probiotics, and enzymes — have not been altered or destroyed and are derived from more natural sources. Some raw manufacturers do add more vitamins and minerals to make up for any deficiencies in the food. Major commercial raw manufacturers incorporate kill steps to destroy pathogens while creating the least impact on the food’s enzymes, proteins and other nutrients. One such method involves high pressure processing (HPP), which works by using intense pressure rather than heat to kill the pathogens including E. coli, Salmonella and Listeria spp. HPP also kills yeasts and molds. Of course, times do exist when the steak might be too rare for your pet. Pets with bowel problems or liver conditions are usually better off with home cooked meals.